Chai tea: Perfect for thunderstorms. When I was young, my parents had some very good luck with daycare providers. There weren’t after school programs or “amenities,” but there were very interesting people like Mrs. Gill and Mrs. DiAntonio, immigrant women with fantastic recipes who were at home all the time, cooking. And looking after me, I guess, but mostly cooking. And more often than not, they shared. From Mrs. DiAntonio, I learned about the other kind of amaretti cookies – the soft ones with the almond thumbprint in the centre, about how magnificent just tomato sauce could be on pasta, that mozzarella doesn’t come in bricks, and that wine is something that happens after you squish grapes with your feet. I never got to taste the wine, but Mr. DiAntonio would make it that way, and grew his own grapes to boot. Today it rained a lot, and there was thunder (and I discovered that Molly is a scaredy cat), and I had a lot of housecleaning to do. A regular cup of tea would not quite have done. I don’t have Mrs. Gill’s recipe, but I remember the taste. If you don’t keep them in your kitchen, go buy the spices – you can buy them at Indian grocery stores, and you get a lot of them for not very much money. I buy most of my spices from Indian grocers (or from the Indian section of Superstore), because they are so plentiful and inexpensive. So, here. 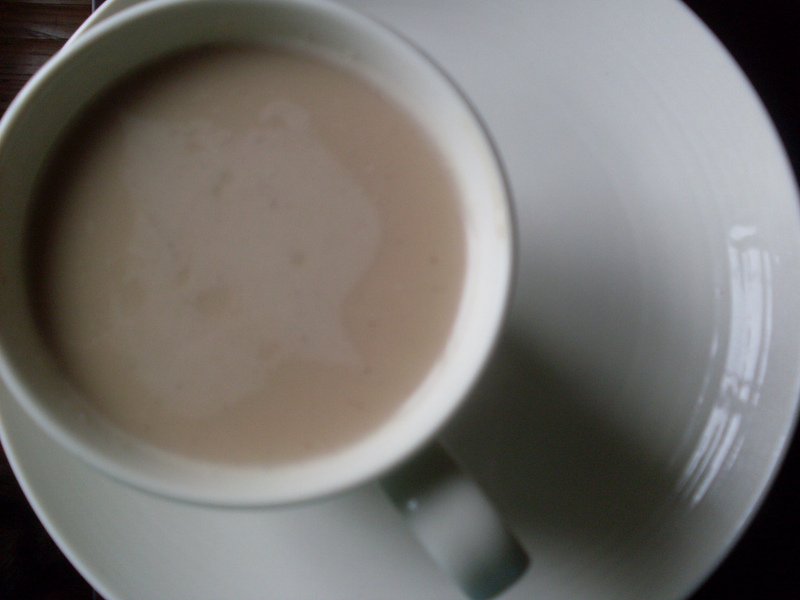 A recipe for chai tea, which I’ll hope you enjoy anytime there’s thunder and downpour, even if you end up drinking it while cradling (and reassuring) a bawling kitten. In a saucepan over medium-high heat, toast whole spices until just fragrant, about two minutes, moving them about the pan frequently. 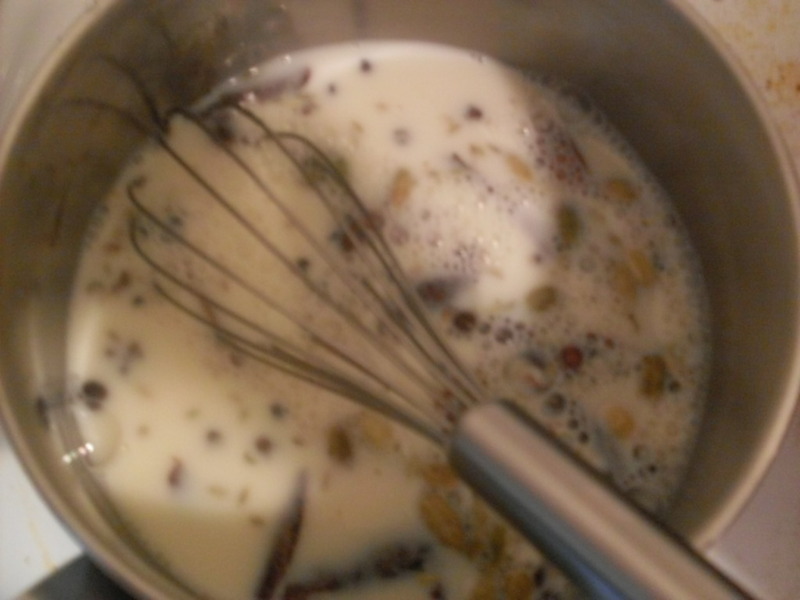 Reduce heat to medium, and add milk and honey, stirring to dissolve the honey. Add teabags once honey is dissolved, and allow to come very slowly to a gentle boil, about 40 minutes. Once it begins to boil, remove the mixture from the stovetop and strain into mugs. Serve immediately. < Previous Meyer lemon shortbread. Next > If, like me, you ate a kilo of Mini Eggs this weekend, a little bit of stewed rhubarb is probably exactly what you need. Actually, a container of the spices kept in the cupboard are wonderful just to open and smell from time to time.